Even though the riding here is not near as good as other locations, there is enough to make it worth taking bikes or atv's here for the weekend. The kids and wife really enjoyed the beach and the water and even though I did enjoy this aspect I was glad there was at least some riding to help occupy the time here. A hot ride followed by a dip wasn't a bad way to go about it. The water level was extremely low on our visit in Aug, and the level went down every day giving another 4 feet of beach a day while we were there. The sand was nice however and the water temp was fairly comfortable at around 78 degrees. In the shallows I am guessing it was warmer than that however, which is where I stayed. We brought an inflatable raft and a canoe but others had jet skis, wave runners, even ski and fishing boats. The wind seemed to kick up every evening blowing sand around, but most nights it wasn't too bad. Bikes and ATV's are allowed on the beach but the signs say to keep the speed to 15mph. We did one beach ride around the other side where we were able to ride faster, but around people we were very careful to stay to the rule. They enforced the generator off time at 10:00 as well, but unfortunately didn't seem to enforce "quiet time" beyond that for some around us. Overall it was a good time and a place we will most likely return. The map below shows some pictures that I snapped while riding the surrounding areas. This should give a good idea of where to ride. There is a fee to camp here as well, I believe it was $16 per night for the North and West Beaches. The West Beach is a little rockier and you are generally less likely to get stuck there. 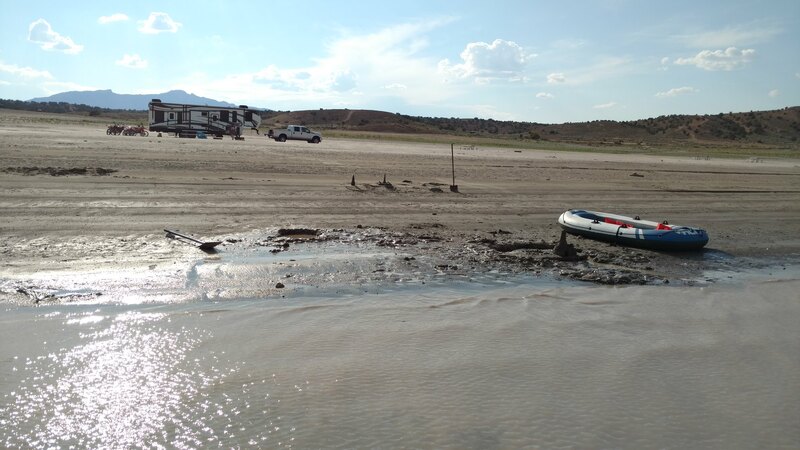 There was one truck that got stuck pretty good when we were there closer to the water so use caution with trailers. 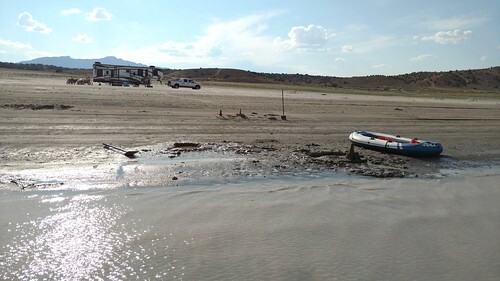 There are tables and pits that seemed like a good guide as to how close to the water we wanted to get the trailer and truck. View of the lake from one of the better trails in the area.